What could the general election vote mean for intergenerational fairness? Posted 14th June 2017 & filed under Blog. Searching for a “meaning” behind the 2017 general election result is fiendishly complicated in many ways, but if you wanted to deduce one single takeaway message from the vote it would probably be that British society remains extraordinarily divided between different groups – whether that’s Labour and Conservative, rich and poor, town and country, pro- and anti-EU, or, especially, young and old. This was borne out by the available data, which suggest that the generational gap in party support was huge. Unfortunately, the election outcome could greatly discourage politicians from addressing intergenerational issues if they are perceived to have played an important role in costing the Conservatives votes. More detailed information isn’t yet available so soon after polling day, but Lord Ashcroft’s post-election poll of 14,000 voters (surveyed on the day itself) suggested that the generational gap in support between Labour and the Conservatives was much bigger than the gap between different socio-economic groups. The latter followed the classic pattern which the history of British politics would lead you to expect: voters in the richest social group, AB, were split 44%/35% between the Conservatives and Labour, while their counterparts in the poorest one, DE, were divided in almost exactly the opposite way, 34%/46% between the two parties. However, the same poll found that voters aged 18–24 were 18%/67% in favour of Labour and voters aged 25–34 were divided 22%/58% between the two parties, while those aged over 65 were 59%/23% in favour of the Tories. These gaps were lent increased importance by the apparent high turnout among the younger voters, which initial analyses of the vote have suggested was much higher than it has been at recent elections. The irony of this outcome is that it was actually the Conservatives who had attempted to grasp the nettle of intergenerational fairness in their manifesto. Whereas Labour’s proposed set of policies was dubbed a “cornucopia of delights” for promising all things to all people – including the protection of all pensioner benefits, free universal higher education and other desiderata besides – the Conservative manifesto included several bold decisions, especially the pledges to means-test the Winter Fuel Allowance and its proposed changes to social care funding. However, given that the reaction to the latter announcement proved to be so negative that the Tories were forced into an embarrassing U-turn shortly afterwards, the obvious conclusion that many politicians will be likely to draw is that angering the “grey vote” may have played a role in costing the Conservatives the election. 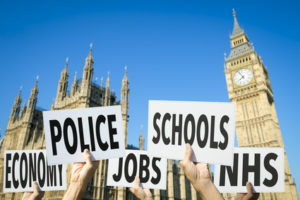 As yet, it is difficult to discern precisely what impact these announcements actually had on the final outcome (for instance, it’s worth noting the absence of social care in the list of top priorities among Conservative voters compiled by Lord Ascroft), but it seems likely that politicians will be wary of going near these controversial topics again in the near future, not least because the Tories look set to govern in some kind of partnership with the DUP, whose manifesto specifically promised to protect pensioner benefits. That would be a great shame for Britain’s politics, not least because the extent of the generational divide in support for the different parties shows how big the gaps are in how different generations see the UK and the problems facing it. It’s particularly unfortunate that the social care reforms went down so badly, as our current social care system is clearly undergoing a deep crisis which is causing misery to those whom it affects, yet the politicians had hitherto been wary of grappling with it for fear of the political controversies it would unleash. The outcome of this election campaign may suggest that they were right to feel this way, but inaction won’t make these problems go away.